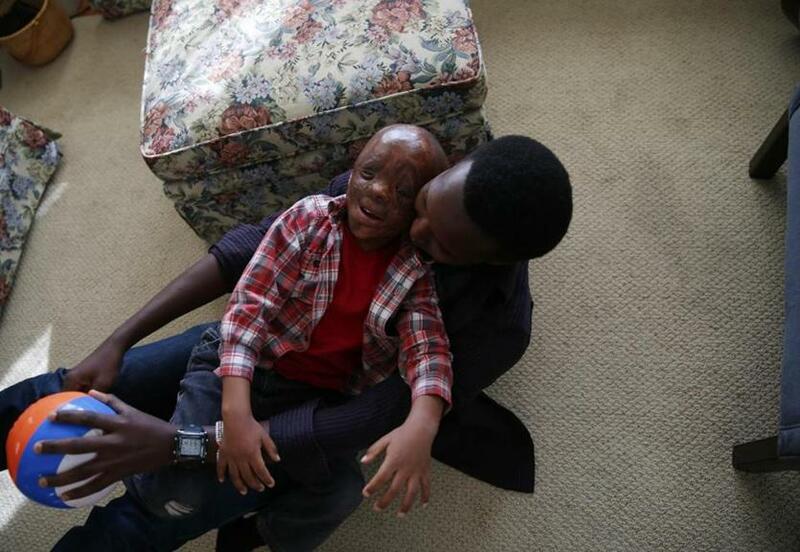 A severely burned boy from Africa and the community that took him in. 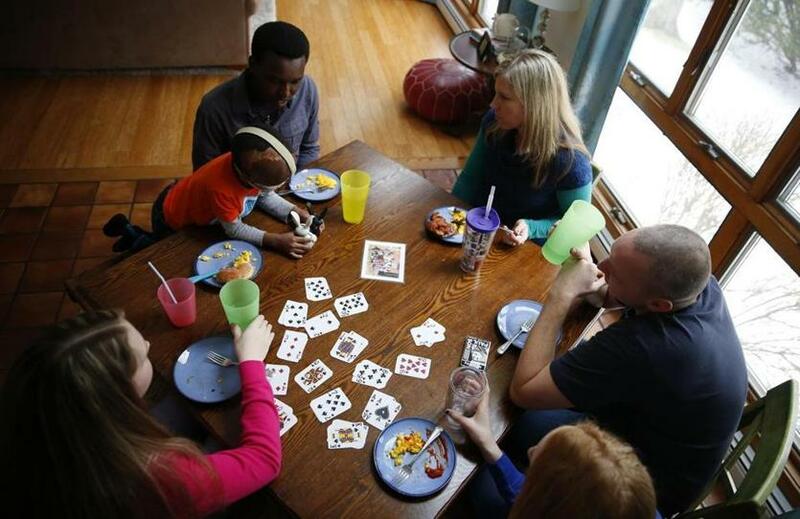 Alex Gitungano, 26, learned how to parent on the fly when he arrived in the United States in June 2014 as the caregiver for Leo Ikoribitangaza, 4. THE PHONE RANG AT 9:23 a.m. Darrell Minnich ordinarily wouldn’t have answered. It was Sunday. In seven minutes, he’d be leading the service at Good Shepherd Christian Fellowship, his evangelical church in Needham. But on this morning, July 27, 2014, Minnich had brought the church’s cordless handset with him into a prayer room, where he and his wife, June, were praying with a small group. The caller’s voice was polite and accented. When Darrell heard the name, Alexis, he thought it was an African woman. We’d like to come to church, the caller said. Is there anyone who could pick us up? Darrell’s first thought was: Couldn’t you have planned this the night before? He spoke to June. She was willing to do the pickup. The address, also in Needham, was only a few miles away. When June pulled up on Central Avenue, she didn’t find a woman. She saw a man and a boy in a baseball cap standing outside, smiling. She noticed the boy’s disfigured face right away as they climbed into her minivan. In his lilting voice, Alexis Gitungano, then 25, introduced himself and his 4-year-old companion, Leo Ikoribitangaza. 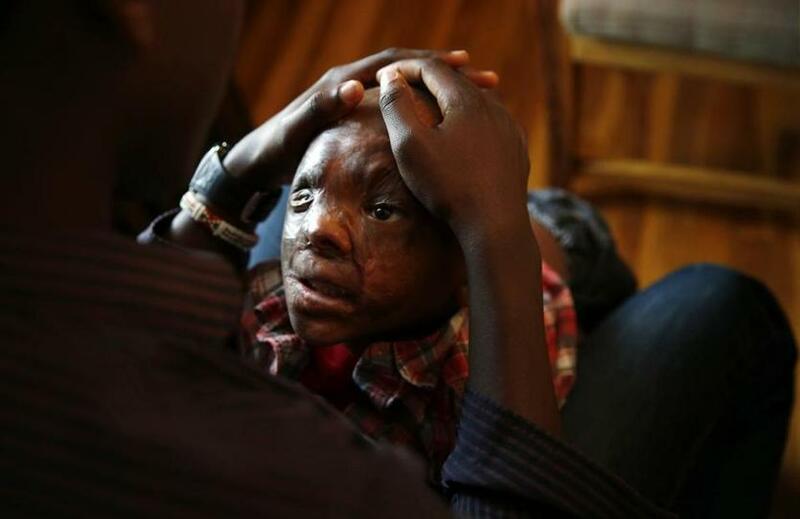 He told of their trip from Burundi to Boston so Leo could get treatment for severe burns he’d suffered as a 2-year-old. They’d arrived only a month before and were anticipating multiple surgeries at Shriners Hospital to rebuild Leo’s nose, lips, and right eyelid. Shriners would do it all for free. Alex, who now goes by his nickname, had found Good Shepherd by typing “church” and “Needham” — the town where they were staying — into Google. He’d called because their ride had fallen through. Darrell was confused when Alex and Leo got there — where was the woman on the phone? But he wasn’t able to meet them yet. Before the service ended, he left to preach at a Chinese church in downtown Boston. June invited Alex and Leo to the house afterward for grilled cheese sandwiches, hot dogs, and salad. She was immediately struck by Alex’s tenderness with Leo. Alex was not his father, not even a relative — just a faithful volunteer chaperoning Leo to America. “It’s not been easy,” he told June. “But God has spoken to me that I must treat him as my son.” Darrell finally met them when he returned home after lunch. He noticed Leo’s damaged face for the first time. “I was totally unprepared for what I saw,” he says. Recognizing Alex as a kindred spirit, Darrell and June, who are both 60, raised the possibility of him and Leo staying at their house — particularly after Darrell began probing their plan for room and board while in Boston. The truth was they didn’t really have one. The arrangements they’d made back in Burundi hadn’t worked out as expected. After two weeks in a Charlestown hotel room, they were now staying temporarily with a Needham family. That was an improvement. Meeting Darrell and June would turn out to be an even bigger blessing. Here, finally, were pillars Alex and Leo could build a community around — the kind of community Alex had craved since leaving the hospitality of East Africa. And build it they would, thanks to a motley group of New Englanders who would take them in, feed them, clothe them, buy them cellphones, toys, books, sneakers, and an iPad, take them to appointments at Shriners, and provide love and encouragement when they needed it most. These relationships, some born out of random encounters, would change the course of Alex and Leo’s lives. So, too, would they shape the lives of their patrons and new friends. Out of nothing, a village would grow. WHEN THEY LEFT the Charlestown hotel, in mid-July of last year, Alex and Leo moved into a guest room at Shriners. They had nowhere else to go. It was OK for a couple of days, but it wasn’t designed for long stays. They had little privacy. A nurse once told Alex that Leo shouldn’t play with another patient because the child had an infection. Out of the blue, Shriners received a phone call from Nadeem Afridi, a Needham cardiologist. Afridi had a friend in Minnesota, a fellow doctor, who had somehow learned of Alex and Leo’s trip to Boston. The friend asked Afridi to check up on them. Afridi and his wife, Fauzia Wali Khan, a psychiatrist, invited Alex and Leo to their home for lunch. They decided to keep them. “I just said, ‘No, you can’t be locked up for days in a little place,’ ” Khan says. Afridi and Khan helped out when Leo’s scar started bleeding and when his hand swelled up from a bee sting. As Afridi and Khan fasted for Ramadan, Alex made lunches for himself and Leo. On Friday, July 18, Afridi came home from work and took Alex and Leo to the playground at nearby Newman Elementary School. Janet Waters happened to be there. She was watching a 3-year-old boy, Cameron, while his parents, who lived across the street, were at dinner. Waters went over to pet Afridi’s black Labradoodle, Pasha. Leo and Cameron began playing together. Waters assumed Leo was Alex’s son. She started asking Alex questions. Alex shared their story — the voyage from Burundi, the expected procedures at Shriners, how down they’d felt in Charlestown. It wasn’t the idle sideline chatter one typically hears at a playground. “I was getting a little bit worked up,” says Waters, who is 58. When Alex began talking about his faith, she felt a deeper connection. His vision of Christianity mirrored hers. Alex played guitar during a Sunday service at a Lutheran church in Hingham. Then Waters had a thought: What if this is some kind of con? What if none of it’s true? She excused herself and approached Afridi, asking him if Alex’s story checked out. Afridi assured her it did. Waters went back to Alex. Leo and Cameron ran together with Pasha. When it started to get dark, Waters and Alex exchanged phone numbers. She wanted to help but didn’t know how. She invited them to her Hingham church. Not long after, Alex texted her to say Afridi could bring them the next Sunday. It’s a safe bet that nowhere else in Greater Boston that morning was a Muslim doctor from Pakistan bringing a Burundian evangelical Christian to a predominantly white Lutheran church. Waters took Alex and Leo to Panera for lunch afterward, then back to Afridi and Khan’s house. Waters soon sat down and composed an e-mail to friends and family. “My head is spinning with ideas about how I can help make Alex and Leo more at home during their stay in this country,” she wrote. The following Sunday, Waters went out of town to visit her sister. That was the day Alex found Darrell Minnich’s church. And on it went. Day by day, new people entered Alex and Leo’s orbit, each with a unique means to help. Gradually, over the coming months, a magical network emerged. It was a nomadic, exhausting way to live — bouncing from house to house, not knowing whom they could rely on next. But it proved tenable enough. Alex and Leo stayed briefly with Dina Chu, the woman who had picked them up at Logan Airport and paid for their room in Charlestown. Cameron’s parents took them in for a few days. They went to stay in New Hampshire with relatives of people Alex had met in Rwanda. They met Paul Chernoff, a semi-retired Superior Court judge, one day on the Green Line after Chernoff offered up his seat. Chernoff had just read the novel Wonder, about a boy with a facial deformity, and was moved to talk to them. “I took one look at Leo and I wanted to hug him,” he said. They remained in touch. Chernoff later raised some money for Alex and Leo and gave Alex a driving lesson. He also took them to the New Balance outlet to buy Alex running shoes and Leo blue and green sneakers. The staff was so taken with their story that they gave Chernoff a steep discount. Leo’s zest for life, despite all he’s been through, is infectious. His cackle seems to carry for miles. But it is Alex’s magnetism, too, that attracts people. His sweet disposition and big heart are immediately apparent. He exudes a kind of saintly propriety. He often appears happy, though one gets the sense he sometimes puts on a good face for others’ benefit. Alex and Leo took a break from schoolwork to play together at the Needham house of Darrell and June Minnich. It was Alex’s beatific nature that first drew in Nate Criser. A 39-year-old from West Yarmouth, Criser is a part-time pastor and director of maintenance at a seasonal resort. One Sunday last August, he was the guest preacher at Heart Change Fellowship, a Jamaica Plain church. Alex had a friend he’d met in Burundi whose sister went there. On this Sunday, Alex and Leo came to church with her. They found seats near the front. When Criser arrived, he sat down nearby. He turned around, said hello, and inquired about their story. Alex gave a brief summary. Criser told Alex he wanted to talk more after the service. It was Alex’s first time at the church and Criser’s first time preaching there. His sermon drew from a passage in the Book of Luke, which tells of Jesus in the time of his resurrection. After the service, Alex and Criser talked for an hour. “Our hearts were really connected,” Alex says. Criser asked Alex if he knew where they’d be staying over the long term. Alex said he didn’t know, but that every day they’d been in America they’d had enough to eat and beds to sleep in. He was fearful at times, but he trusted that God would continue providing. “If you ever need a place to stay, that answer is always yes,” Criser told Alex. They exchanged phone numbers, prayed together, and said goodbye. Soon after, Alex learned that he and Leo would have to leave the home where they were staying because the family had guests coming. Alex called Criser, who picked them up and moved them into the home he shares with his wife, Susannah, and their two teenage daughters, Abbey and Noel. The girls took to Alex and Leo, who became regulars at their volleyball and basketball games. “They have brought so much richness and fullness to our life,” Criser says. Nate Criser (at right) and his family opened their West Yarmouth home to Leo and Alex after a chance meeting. LEO IS RECLINING ON an exam table, one leg propped on the other. He’s come to Shriners for a checkup in mid-March, but he looks like he’s watching a football game at a friend’s house. “Can I just stay like this?” he asks the nurse. 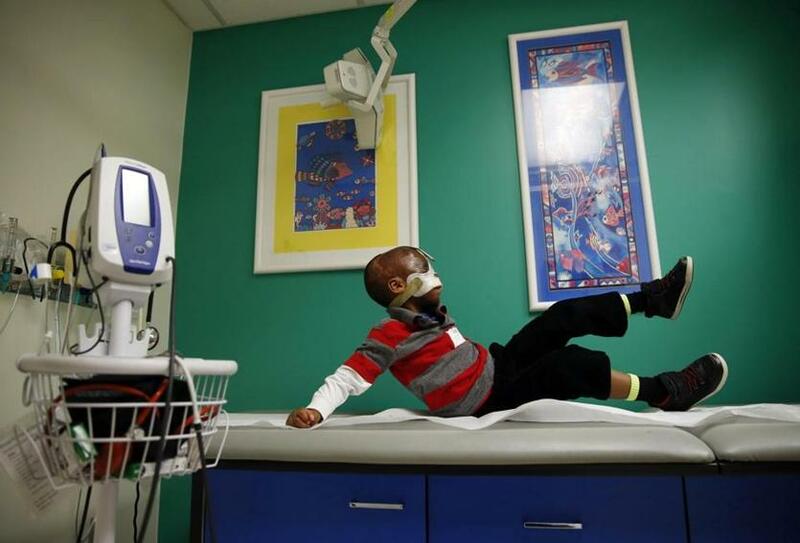 Leo playfully climbed onto an exam table at Shriners Hospital in Boston. Leo then lies flat on his back. He’s studying two whales painted on the ceiling tiles. “I don’t like the whale,” he says to no one in particular, as if he’s been speaking English for years. Leo’s doctor, Richard Ehrlichman, comes into the exam room. “Hey, how are you, buddy?” he says. “What are you doing?” Leo asks him. “I’m waiting to see you!” Ehrlichman says. 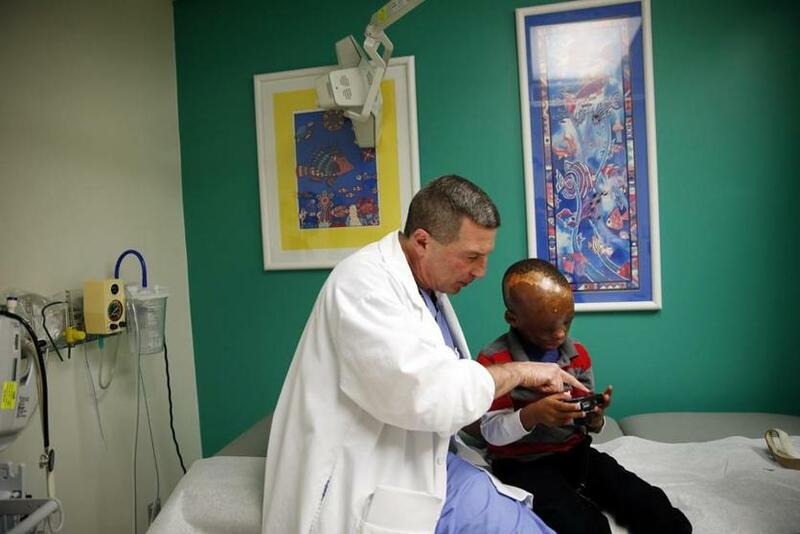 Ehrlichman, 58, is one of the staff plastic surgeons at Shriners and Massachusetts General Hospital. He has performed all of Leo’s procedures in Boston. He’s also deputy commander of the Massachusetts National Guard’s medical command, deploying as a battalion surgeon to Afghanistan for several months in 2011 and 2012. When Leo first came to Shriners last summer, a serious infection in his right eye delayed his initial surgery. Once it was gone — after Alex spent a couple weeks applying eyedrops three times daily — Ehrlichman repaired, over the course of several months, the upper and lower eyelids of Leo’s right eye, and then fashioned new lips. In both areas, Ehrlichman eased tension caused by scar tissue and rebuilt Leo’s features using skin grafts from elsewhere on his body. Leo’s progress, even to an untrained eye, is plain. Grafts are critical to burn treatment, because doctors need new tissue when they release contractures. It’s like the opposite of getting stitches: Ehrlichman pulls apart a damaged area and uses fresh skin to patch the holes. In taking grafts, he can remove skin layers as thin as twelve-1,000ths of an inch. The harvested tissue adapts and thrives in its new environment, and skin regenerates where the graft was taken. Dr. Richard Ehrlichman, who has performed all of Leo’s surgeries in Boston, pointed to a picture taken during one of Leo’s appointments. Overall, Leo has handled his procedures well. 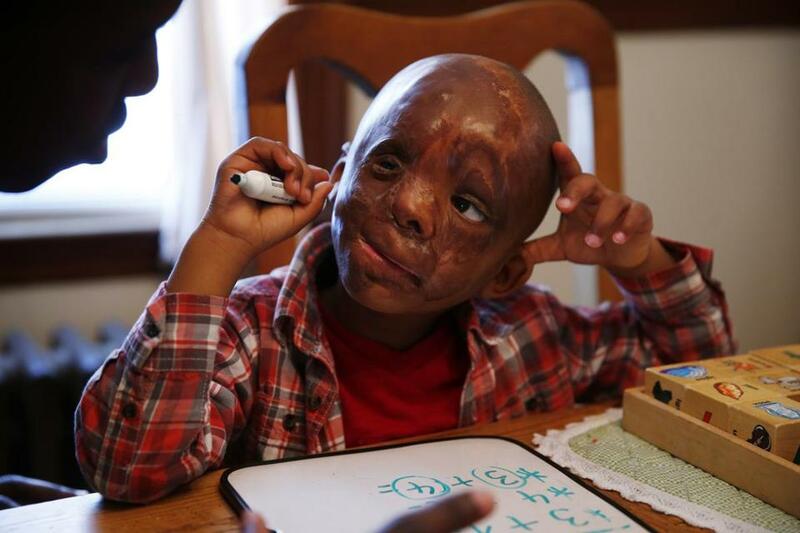 “Nothing really fazed him,” says his care coordinator at Shriners, Taya Zbell Cloonan. But after Ehrlichman worked on Leo’s lips, a couple days before Christmas, the recovery was hard. They were staying with the Crisers on the Cape. Leo, his face obscured by a mask, could only eat soft foods like yogurt, mashed potatoes, and soup. Sometimes Alex fed him by putting dabs in Leo’s mouth. Leo’s favorites, like pizza, were off limits. He couldn’t run around. “Alex, can I do that?” he would ask when he saw other kids playing. “No,” Alex told him, which made Leo angry. “God, help me,” he prayed. Susannah’s warmth felt like a gift. Alex needed the encouragement. “I’m the kind of person, when I’m going through a hard time, I don’t want to keep things in my heart,” he says. Shriners, too, has been a source of support. The staff taught him how to care for Leo — how to clean him, apply cream on his scars, and massage his skin. The hospital’s partnership with Massachusetts Eye and Ear Infirmary afforded them expert care for Leo’s damaged eye. Early on, Cloonan showed Alex how to use voice mail. They practiced at her desk. Every morning following Leo’s December 2014 surgery, Alex gently removed Leo’s mask to wash his face and apply ointment to his skin. Once Shriners accepts a child for treatment, the hospital fully commits. 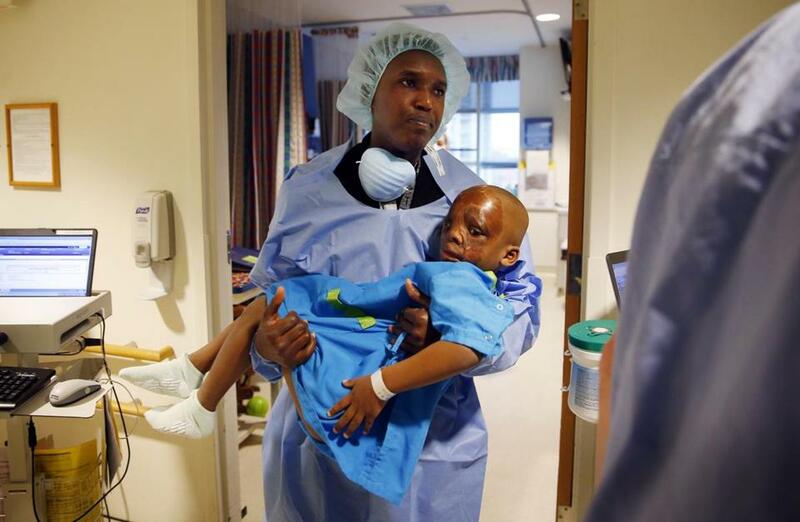 With burns, doctors often have to space out surgeries, because children’s bodies grow and change. Some patients will come back to Shriners year after year into early adulthood. The blueprint for Leo, such as it’s known, is that he’ll go home to Burundi within a few months and return to Shriners a year later. His progress and his growth would dictate future surgeries. Ehrlichman’s hope is that 25 years from now Leo can walk down the street without most people noticing the skin grafts. “I’d like his face to represent who he is inside, which is just this amazing kid,” Ehrlichman says. At the March appointment, Ehrlichman shares with Alex his plan for an April surgery, detailing how he will release contracted tissue on the right side of Leo’s face and reposition and rebuild his nose. Alex cannot hide his nervousness, not with December’s difficult recuperation in mind. “It’s going to be a big one,” Alex says. Leo, meanwhile, notches a small victory. For now, his medical team tells him, he can stop wearing the mask that protects his grafts. Afterward, Alex and Leo walk from the exam room to visit Cloonan, who keeps one of Leo’s drawings, a constellation of circles in rainbow colors, taped to a file cabinet. Leaving her office, newly liberated from the mask, Leo is running in the hallway, putting his face into the wind. Every morning or night, Alex makes Leo recite these words in the mirror. Even before Leo knew English, Alex made him say it. The two of them spend nearly every waking hour together. Most days, Alex home-schools Leo, teaching him math and how to read, write, and speak English using Sesame Street stories, workbooks, and an electronic spelling machine. Leo’s command of the language floors people who knew him when he first arrived. Nate Criser remembers when the word “gentle” prompted Leo to wrestle harder. During one of their near-daily home-school sessions, Alex taught Leo how to add numbers using a marker board and wooden blocks. Alex puts straws in Leo’s Capri Suns. He brushes Leo’s teeth. He reads to him before bed and teaches him Bible verses. He scolds him when Leo isn’t carrying scissors safely. “Ah-LIXXX!” Leo says when he needs something. “He loves me so much, and I love him so much,” Alex says. He even makes corny parent jokes, which Leo does his best to tolerate. “Are you Baby Leo?” Alex asks him one morning at the Minniches’ house in Needham, shortly after Leo wakes up. A little while later, Alex rests his laptop on the dining room table and plays “My God Is Good,” a gospel song from the South African group Joyous Celebration. Here in the middle of breakfast — a bowl of Trader Joe’s O’s for Leo, toast and Korean honey citron tea for Alex — they begin dancing. Leo shimmies in front of the radiator, sunlight streaming in the window behind him. “When he’s happy, I’m happy,” Alex says later. “When Leo is angry, I’m angry.” Not only is Alex getting a crash course in parenting, Darrell Minnich notes, but in a foreign country and in the spotlight, always in the homes of others. Leo, meanwhile, becomes more Americanized every day. He’s fluent in cartoons and video games. He could work an iPhone in his sleep. He has nice clothes and eats well. He’s developed a taste for ice cream. Around New Year’s, Alex called Leo’s parents in Burundi and put Leo on. His mom called him Iko, his nickname back home. “I’m not Iko. I’m Leo,” he said. Alex grabbed the phone to explain. In Kirundi — Leo’s first language — she asked Leo how he was and whether he was going to celebrate the new year. But Alex and Leo had, over the previous months, been speaking less Kirundi and more English. On the phone, Leo would only speak English, which his mom didn’t understand. She was happy, though. She recognized the value of what he was learning. Alex, too, has grown. He’s improved his own English and picked up local idioms and customs. He’s learned to emulate American pronunciation of names and how to tell their story more succinctly, to make it easier to grasp. His sense of humor is sharper, his radar for sarcasm more advanced. He’s experienced the charms of Boston, the serenity of the Cape, the awe of the Rocky Mountains, the big skies of Idaho. IT’S A SATURDAY MORNING in February, and Boston is bracing for another blizzard. Alex and Leo escape just in time, boarding a plane for several weeks in Idaho with Ladd and Carley Serwat. Every time he flies, it seems, Leo is fawned over. This trip is no different. Before long, he’s walking the aisle with the Delta flight attendants collecting trash — a bit fast, but he gets the job done. After landing, he’s invited into the cockpit. He presses every button and switch he can reach. He is not shy. 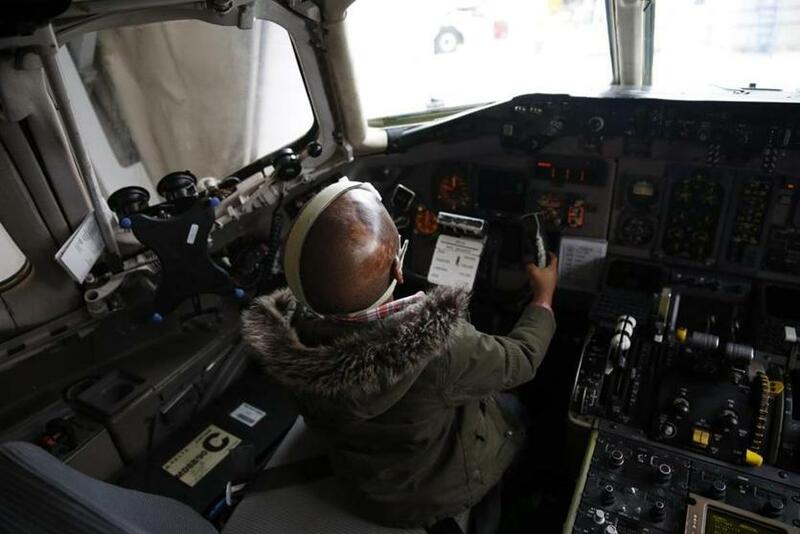 “We’re going to have to get you an airplane,” the pilot says. When he flies, Leo gets treated like a minor celebrity. On a recent trip out West, he was invited into the cockpit. The next morning, Leo’s star burns brighter. Ladd and Carley have brought him and Alex to Anthem Friends, the church in Hayden, Idaho, that’s been supporting Leo’s treatment and his and Alex’s journey. Leo is greeted in the lobby with fist bumps and hugs. Having them at Anthem — witnessing their progress and good spirits — validates the congregation’s involvement. “Oh, you’re here! Wonderful!” a woman says to Alex. THE FLUORESCENT LIGHT overhead is harsh, especially for 6 in the morning. But it’s not enough. Leo remains asleep, tucked under a green blanket on a twin bed in their third-floor guest room at Shriners Hospital. When Alex finally rouses him, Leo, wearing red and black pajamas with the word “AWESOME” on the chest, wipes the sleep from his eyes and sits up. “God will be with you in the operating room,” Alex says as they pray together. In a small room at Shriners Hospital, Alex woke Leo before his most recent surgery. After bathing and dressing Leo, Alex leads them out of the guest room toward the elevators. He drops a small neon-green basketball on the carpet and kicks it ahead of him. Leo scampers forward and sends it back, the ball skipping through the empty corridor. He could be, in this stolen moment, any other soccer-loving boy. Alex’s nerves build in the preop room, where he changes Leo into a sky-blue gown and sea-foam green hospital socks. As doctors and nurses ready Leo for surgery, Leo laughs at the Disney Junior cartoon on the TV and checks Alex’s ear with a red toy otoscope. “Hola, hola,” Alex sings along with a pretend laptop Shriners keeps in a bucket of distractions. When it’s time to go, Alex picks Leo up in his arms like a baby, carrying him through the double doors, past the seascape mural painted on the nursing station, and into the operating room. Alex carried Leo into the operating room before his April 21 surgery at Shriners. An hour and 45 minutes later, Ehrlichman bounds into the parents’ waiting room with good news: The surgery has gone better than expected. Releasing the compression next to Leo’s nose has opened up his right nostril, making it less likely Leo will need another major procedure before returning to Burundi. “I’m so excited about that,” Alex says, his relief apparent. EVERY DAY, THE QUESTION looms larger: What happens next? Ehrlichman says he’s not that concerned about Leo’s wounds when he returns, or about him getting an infection. What worries him is a head injury. Leo’s scarred scalp would not afford him much protection from trauma, he says. Alex has tried to maintain Leo’s connection to Burundi by having him name his parents and siblings as they look at family photos. Leo’s mom and dad say through a translator that it’s sad Leo is so far away, but it wouldn’t trouble them if he could somehow remain in America. In Burundi, Leo’s father says, “There’s really no future.” One day, he says, the family would love to follow Leo here. Leo’s mom wishes she could pick up everyone who has helped Leo and hug them. “What they’ve done is just incredible,” she says. For Alex, Burundi’s recent political strife complicates his feelings about returning. He would still likely find some relief being back home, at least for a while. He misses his family. Plus, all the moving around, the constant reliance on others’ generosity, takes a toll. That tug he felt in the beginning — between supporting his mom and going off to help Leo — remains. Alex’s mother, Rachelle, says she feels his absence and hopes he will contribute to the family. She recognizes, though, the blessing he is for Leo. “God gave him a good heart,” she says. 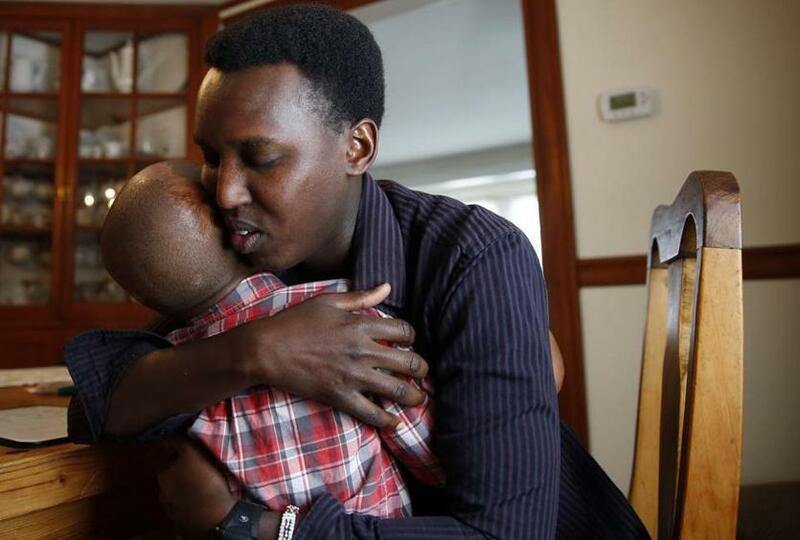 IN DECEMBER 2013, a few days after Alex returned with Leo from Rwanda — their first trip out of Burundi together, so doctors could evaluate Leo’s eye — Alex was sitting at home talking to his mother. He was reflecting on this strange direction his life had taken. Why was he helping this little boy he hardly knew? What was motivating him? That’s when the memory popped in his head. He saw himself more than 20 years earlier, a child a little younger than Leo. He saw the gas lamp in his family’s house. He saw himself playing with it. He saw himself being scalded. Twice. “Hey, Mom, do you remember that I was burned by a petrol lamp?” he said, lifting up the vest he was wearing, to see if he still had the scars. He did. Maybe there was a deeper reason he was doing this, he thought. Maybe this calling he felt — this chapter of his life — had been determined long ago.